There are two major types of speaker systems that are used in audio/video installations. Constant voltage (sometimes known as 70-volt or 100-volt), and ‘low impedance’ systems. In this primer, we will address the latter ‘low-impedance’ systems, and the proper method of wiring from an amplifier to one or more speakers. An important thing to remember when wiring any speaker system is that you are sending electrical signals to a transducer, and therefore, all the rules of electricity are in play. A transducer simply changes one form of energy into another. In the case of a loudspeaker, electrical energy is being changed to magnetic energy (in the loudspeakers’ voice-coil), and the magnetic energy is pushing air, which translates to sound waves. The first thing to do before wiring will be to consider your amplifier. Many amplifiers will have different types of connections for 8-ohm, 4-ohm, 70V, or 100V connections. We are going to want to concentrate on the 4/8-ohm connections, and ignore the 70/100V connections – those are for constant voltage systems and work quite differently. 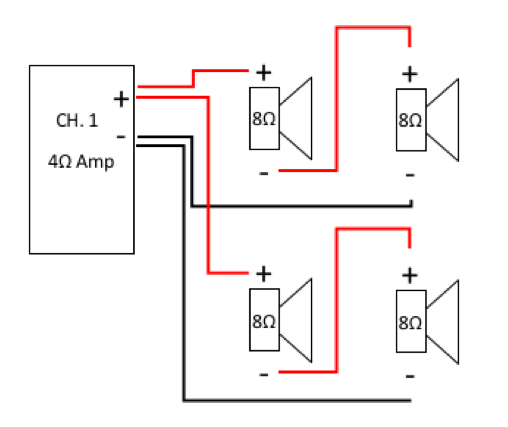 If you have a single channel amplifier, there will be only two connections you need to make – COM (or ‘-‘ minus) and ‘+’ plus. Typical wiring will have red or white as ‘+’ and black as ‘minus’. This is different than electrical wiring, where the black is hot and the white is neutral. While your amplifier is OFF connect the black wire from your speaker cable to the COM/minus/ black terminal and your red wire to the 4-8ohm/plus/red terminal. If you have a multi-channel or stereo system, you will have more than one speaker output on the amplifier, repeat the connection procedure for the other speaker channels. Amplifier outputs utilize many different methods of connecting the cable; including screw-terminal, ‘Phoenix’ (or captive-screw), 5-way binding post, or Speakon™. The only connection that requires an additional connector is Speakon™, but connectors exist for other types to aid in installation. Screw terminal – Place the stripped wire under the screw and tighten the screw. Be sure not to let any strands wander near the other terminals! ‘Spade’ connectors can be used for a cleaner install. 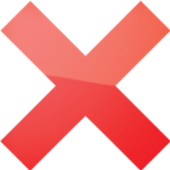 ‘Phoenix’ – Remove the connector. Place the stripped wire into the receptacle and tighten the screw. Be sure not to let any strands wander near the other terminals! install. Some people like to ‘tin’ or solder the ends of the wire; but this is not recommended. 5-way binding post – So-called due to five methods of connecting. We can use the most common. Unscrew the terminals until the hole in the post can be seen. Place the stripped wire into the hole and tighten the screw. Use a large coin to tighten. Speakon™ – Attach the connector (not included with amp) to the end of the cable. Insert the connector into the the jack and turn clockwise until you hear a ‘click’. There are different types of connectors, so check www.neutrik.com for more info. Connecting to the loudspeakers is generally the simplest part of setting an audio system. For low impedance speakers, there will be two terminals – ‘+’ plus and ‘-’ minus. Connect the stripped speaker wire to these terminals just like you connected to the amp on the other end – red or white to plus, black to minus. It is important not to get this connection backwards, especially if you have multiple speakers. The audio will be ‘out of phase’ and will sound very strange. 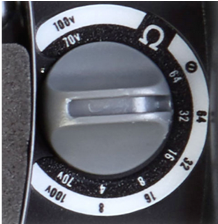 In some cases, you may use a speaker that has a combination of 70/100v settings and a 4/8 ohm bypass. Make sure when installing the speaker, you set it to the bypass mode, or you will get very low volume from the speaker. The physical connectors used on speakers vary widely, but most will use binding posts, screw terminals, or captive-screw, just like the amplifiers. Low impedance wiring is very simple when you have one or two speakers, but can become very complex when you have many. The most important thing to consider when wiring is ‘impedance’. Impedance is similar to resistance in electrical terms, but it is frequency dependent. You cannot test impedance with a standard multi-meter, so unless you have an impedance meter, trust the specification on the speaker. It is very important to match the output impedance of the amplifier with the impedance of your speaker line; for example, if you have an amplifier that is rated at 4 ohms, try to match the speaker impedance to 4 ohms. This is not always possible, but it is better to err to the side of a higher speaker line impedance than the amplifier is rated for. Conversely, you can damage the amplifier if the line impedance is much lower than the output is rated for. There is a simple axiom to follow tor try to remember this impedance rule: ‘Low into high, you’ll get by. High into low is a no-go.’ When your speaker impedance is higher than your amp, you will not damage the amp, but you will lose some volume due to efficiency. When you need to connect more than one speaker per channel, you need to make a decision as to whether to wire them in series or parallel. You should choose the method that best matches the impedance of your amplifier output. Luckily, it is fairly easy to calculate if you consider that every time you double the number of speakers (with equal impedance) you will halve the impedance of the line. So for example: two 8-ohm speakers paralleled would be 4 ohms, and four 8-ohm speakers paralleled would be 2 ohms. The speaker line impedance is 4 ohms, so it matches the 4-ohm output of the amplifier perfectly. This seems pretty straight forward, too – right? What if you want four speakers in a room, all off one channel of an amplifier? This is bad wiring. You will likely damage the amplifier, as the speaker line impedance is 2 ohms. Most amplifiers cannot handle 2 ohms or below loads. So, if you have two 8-ohm speakers wired in series, the speaker line impedance will be 16 ohms. This wiring is ok, the speaker line impedance is 16 ohms, which is higher than the amplifier output (4 ohms). This could be better, though, as a lot of power from the amplifier is being wasted. By using a combination of series and parallel wiring, you can manipulate the speaker line impedance to get the most efficiency from your amplifier without damage. 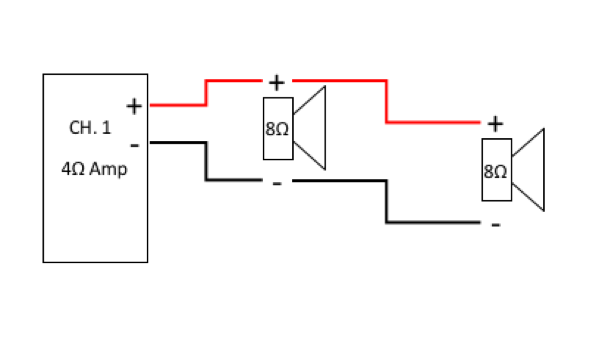 In this example, there are two calculations at play: the first considers that there are two runs of 16-ohm impedance, as the speakers are wired in series. By paralleling the two circuits at the amplifier, the total speaker line impedance is cut back down to 8 ohms. 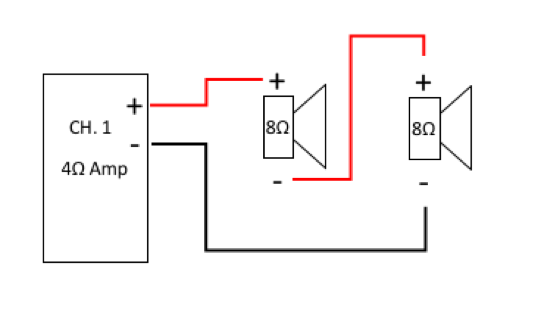 This may look a little complicated, but you are making two circuits that are each in series, and connecting them both at the amplifier. 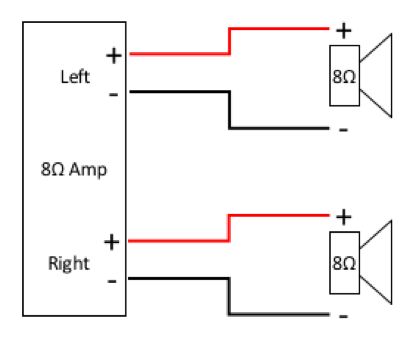 By connecting at the amplifier, these two ‘series’ circuits are ‘paralleled’ together (hence series-parallel). Bridge-mono wiring is a mode that is possible with certain multi-channel amplifiers. It allows you to combine the output power (watts) of two channels. It is primarily used to power a single loudspeaker that requires a lot of power (watts), often a subwoofer. You should check the manual of any amplifier before attempting a connection of this type! Each amplifier engages this mode, and each accomplishes it a little differently. Wiring incorrectly WILL damage your amplifier. The trade-off for the added power is that the output impedance of the amplifier is cut in half (usually from 8 ohms to 4 ohms). The rules for series, parallel, and series-parallel speaker wiring are consistent for an amplifier that is in bridge-mono mode. 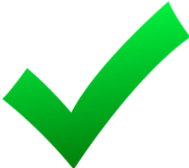 Use the examples laid out in this document to take best advantage of the extra power.